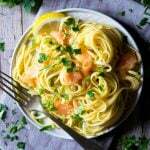 A healthy and simple smoked salmon pasta carbonara recipe. Made with just five simple ingredients and ready in 10 minutes. It’s a super quick and delicious weeknight meal that’s creamy (without any cream), luxurious and packed full of flavour! After substituting guanciale or pancetta for smoked salmon in my pasta carbonara I was SO impressed with how much flavour was packed into it with so little ingredients. It’s creamy and smokey and just sooo delicious especially topped with some finely chopped parsley which adds a burst of freshness. 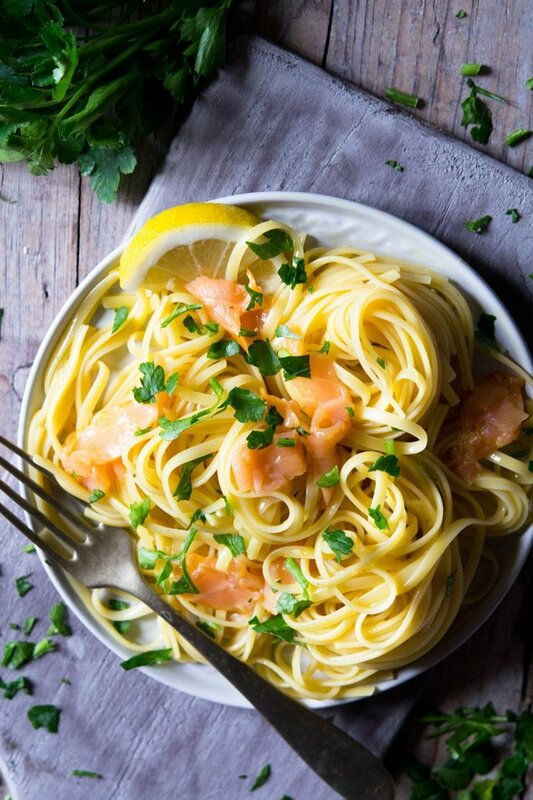 This smoked salmon pasta is made with linguine pasta, one of my favourite long pasta shapes but you could also use spaghetti, fettuccine or even bucatini (a hollow spaghetti shape). I also make this smoked salmon pasta with a simple and traditional carbonara sauce, there’s no cream involved people, no cream. All the sauce consists of is egg, grated parmesan and salt and pepper. Four of the simplest ingredients that almost everyone has in their kitchen as an everyday staple. Tip: wait exactly 1 minute before pouring over the egg mixture. If the pasta is too hot the eggs will scramble but if it’s too cool the eggs will remain raw. This has got to be one of the simplest and quickest pasta recipes out there, it is just so easy to make and you can’t really go wrong as long as you use my tip above to prevent the eggs from scrambling. I’ve seen and made many pasta carbonara recipes in my time and I find that using 1 egg less as many servings works best. Does that make sense? For four servings I use 400g/14oz of pasta (100g per portion) and 3 eggs. I’ve seen recipes that use as many as 6 eggs for 4 servings and that is just wayyyy too much egg for my liking, I just don’t like the taste. For me, the ratio I’ve used in this recipe works perfectly. The egg just coats the pasta and no more, it’s creamy, silky and exactly how it should be. 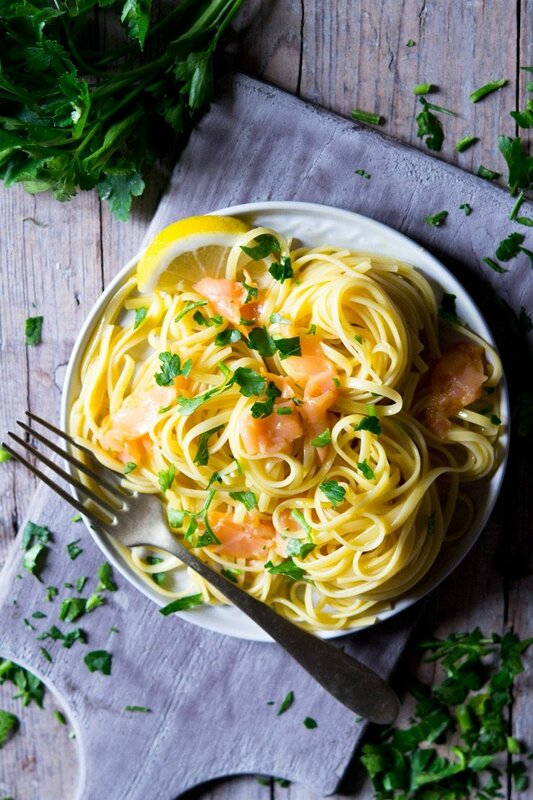 If you’ve tried this smoked salmon pasta carbonara or any other recipe on the blog then don’t forget to rate the recipe and let me know how you got on in the comments below, I love hearing from you! You can also FOLLOW ME on FACEBOOK, TWITTER, INSTAGRAM and PINTEREST to see more delicious food and what I’m getting up to. 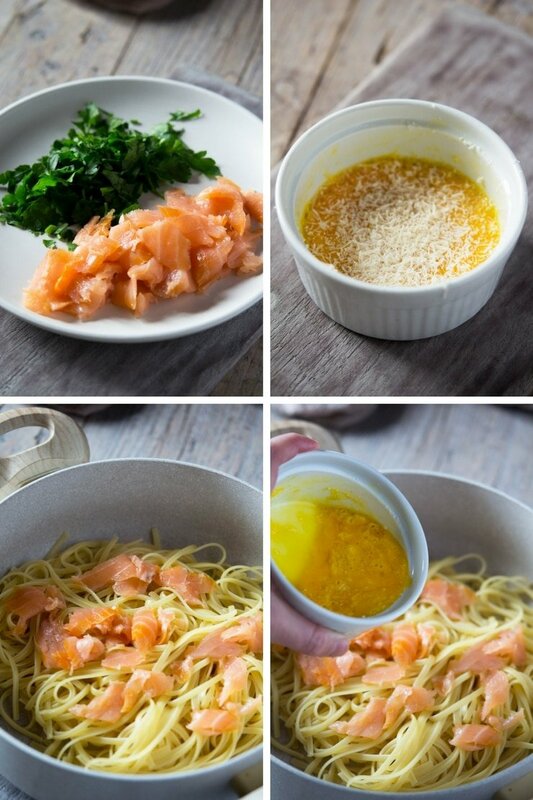 Wow my husband loves salmon (and I love pasta!) so this sounds like a great recipe for us both! OMG this sounds amazing! Smoked salmon is so yummy and I never thought of using it in carbonara. Love it! Pinned for later. My family loves a carbonara and this one looks absolutely delicious – I usually make mine using cream so will have to try it without. Definitely try it without, it’s much lighter but just as delicious! I am absolutely loving the look of this! Love how it’s only 300 calories too as these kinds of dishes can often be very calorific. I’m drooling over here because your recipe looks so darn good. I cannot say I’m well verse with Italian cuisines but would love to explore them some time. Thanks so much Alia, that’s so nice of you!